Great Bend, KS - In the first half of the double header at SRCA Dragstrip and the NHRA Lucas Oil Drag Racing Series Cornbelt Classis David Rampy continued his winning ways with his 61st NHRA divisional event win and Mike Town and Mark Grame grabbed their second straight wins at SRCA. Grand Bend, KS - Mark Grame, Overland Park, Kan., and Tim Nicholson, Concordia, Kan., grabbed the wins in Super Comp and Super Gas respectively. Grame and Nick Folk left the line together with Grame squeaking out the win with a .022 package. Great Bend, KS - The other drivers visiting the winner’s circle were David Rampy, Piedmont, Ala., in Super Stock; Scott Burton, Golden, Colo., in Stock Eliminator; Jeremy Hook, Wichita, Kan., in Super Comp; Kevin Dyck, E. St. Paul, Manit., in Super Gas. Great Bend, KS - J.R. Lobner led the list of winners advancing to the final round in both the Fineline Madcap Top Dragster and the Jerry Haas Racecars Top Sportsman classes. 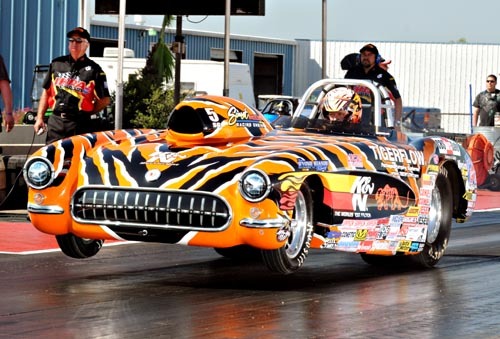 Great Bend, KS - In the final results from NHRA Lucas Oil Drag Racing Series Thunder on the Plains and SRCA Dragstrip, Kansas natives Steven Wilson, Emporia, Kan., and JR Lobner, Gardner, Kan., took home the wins in Super Street and Top Sportsman respectively. Great Bend, KS - It was a family affair for the NHRA Lucas Oil Drag Racing Series Thunder on the Plains at S.R.C.A. Drag Strip this weekend as Glen Amerine nearly shared the winner’s circle with his son Craig who was the runner up in Top Sportsman, and brothers battled in the final round for the Stock Eliminator championship. Great Bend, KS - Lobner from Gardner, Kan., ran 179.54 mph in seven seconds flat to defeat his dad John Lobner, Desoto, Kan., in the division’s Fineline Madcap Top Dragster final. J.R. who was also running in the Jerry Haas Race Cars Top Sportsman class also has a sister Jeryka that was also pulling double duty racing in the Super Comp and Super Street classes. Great Bend, KS - Tommy Phillips earned his fourth major event victory of the young season Sunday when he drove his Tigerflow/K&N Engineering backed Corvette Roadster to the victory in Super Gas. Great Bend, KS - J.R. Lobner, Garner, Kan., took home the win in Top Dragster against fellow Kansas racer, Tom Williams, Leonardville, with a run of 7.349 seconds at 179.90 mph. Clint Neff will enjoy his ride back to Arvada, Colo., with his winner’s trophy in Comp Eliminator. Great Bend, KS - Several home state racers advanced to the final rounds with Phil Unruh of McPherson, Kan., taking the win over Larry Piper, Wamego, Kan., in the division’s Top Dragster class and Steve Domingues, Derby, Kan., took out Craig Pfanenstiel, Hays, Kan., in the final of Super Street.